Home Off Beat	Poetry tattoo: God is always with you…. Surely, you all have read the famous inspirational poem âFootprintsâ. I bet you read it in a book or on some poster, right? 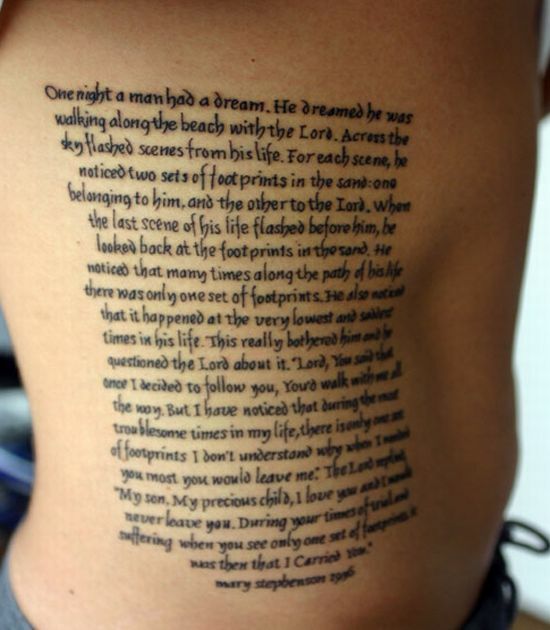 How about reading it now on a human body? Yups, a tattoo fanatic got so inspired with the poem that he got it inked on his body. Never knew, this poem was so inspirational! :)One thing is for sure that this fellow whenever in trouble or pain will always remembers Godâs words which will give him strength and courage to bear the pain. One of the coolest ideas to remember that almighty is always with us! ← Chrome microphone tattoo: Music is in the air!